Miss Martha Berry thanks a friend of the schools for a contribution for the "silver anniversary". 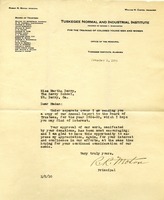 A thank you letter written by the principal at the Tuskegee Normal and Industrial Institute, thanking Martha Berry for her donations. 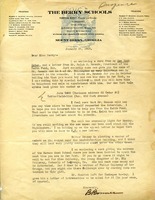 B. Bonner suggests that Miss Berry meet with two prospective donors on her trip to New York and discusses other office business. 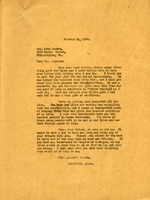 She provides travel details for Berry's visit to the Horace Mann School and mentions that Mr. Hamrick left that day for Tuskegee.